In 2014, the Parks Alliance partnered with the Trust for Public Land on a report detailing the impact of San Francisco's recreation programs, parks and open spaces on the local economy. The report found, not surprisingly, that San Francisco's iconic parks and natural beauty generate a lot of tax revenues and business activity, approaching $1 billion each year. Park lovers have known for a long time that investing in building new parks and maintaining old ones is good for our City, and now we know just how good. The report proves that building and maintaining a flourishing parks system is sound fiscal policy. Download a full copy of the report here. 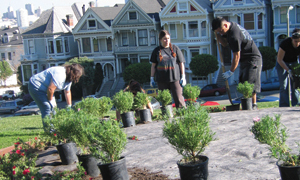 Read the SF Parks Alliance press release on the report. Parks contribute to City revenues in two ways: property taxes and tourism. Parks contribute to the wealth of SF residents. Parks save SF residents money. The environmental benefits of parks save the City money. Compared with other major cities, the economic benefits generated by San Francisco's iconic parks and extensive recreation options are quite large.